The Pilot G Tec C–A Great Pen! As I may have mentioned recently, I've found that writing story notes and ideas by hand with pen and paper is helping me get more into the creative flow. Two things make that process better. One is a large, college-ruled spiral-bound notebook. The other is a great pen. The Pilot Hi Tec C and its nearly-identical-twin the Pilot G Tec C are, for me, great pens. Their 0.4mm tip is fine enough to write thin lines, which is must if your printing is as small as mine. 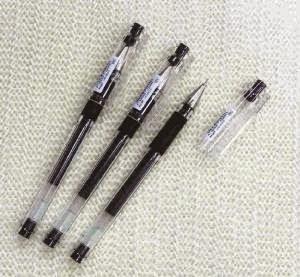 But unlike many needle point pens, these don't scratch the page as you write. The gel ink makes for smooth writing, much smoother than most other pens. And the fact that they're relatively cheap (around $2 each) means that I'm happy to carry them around with me without worrying they'll be lost or stolen. They're comfortable to hold, and not bad looking. I've heard some say that they look rather "cheap" or "low-end" for a pen that writes so well. I personally see that as a plus. If they looked high-end, others might want to swipe them. If they look like a cheap generic brand pen, no one will suspect how awesome they really are. So far, of the many pens I've tried, this is my favorite. Best of all, Amazon Prime customers can get them shipped free to their door.